When turning slightly left, but not right, the whole car shakes. Feels like the right wheel's about to fall off. It used to do it at about 55 mph, but for the past couple of days it's been doing it at about 40 mph. Had car to mechanic but they couldn't figure it out. 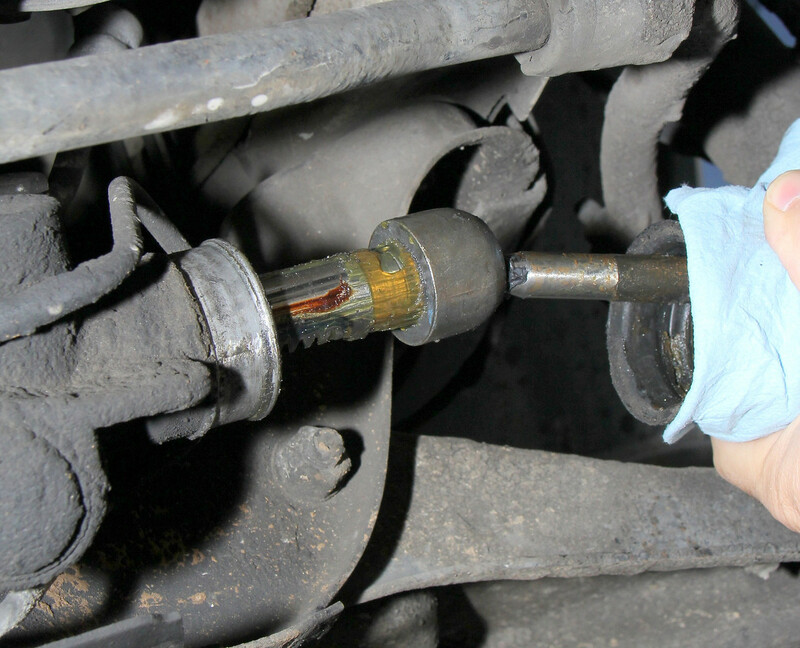 Lower ball joints replaced not long ago, as well as engine mounts, struts, shocks, sway bar links. Mechanic tried changing wheels/tires but no difference. Any ideas? If everything wheel/suspension wise has been checked, the only thing that comes to mind is a shudder possibly caused by a differential problem. These cars have a limited slip of sorts and some binding there may cause some such vibration, but this is a long shot... Another possibility is a steering rack going out and binding at certain speeds. or a bad steering inner ball join, under the bellows. jack the front wheels up, with the front of the car on stands, have a friend grab the front wheel at 9&3, and gently rock it back and forth, while you 'feel' the tierod that comes out of the bellows to see if thats moving relative to the steering rack. you might have to pull the bellow back off the rack to expose the inner tierod balljoint for confirmation. I second the wheel shake down, and also grab the wheel at 12 and 6 and shake there. That's usually a good check for wheel bearings. Since this car has no cv axles, check the inner tire wear. Can't help with the differential but since the rear wheels spin at different speeds in turns there could be an issue there. I seriously doubt its the locking differential, those won't lock even when making a very tight u turn unless you spin a wheel. X2 on the inner tie- rod. I find it more definitive to test by separating the outer tie- rod end and then pushing/ pulling the tie- rod in and out towards and away from the steering rack as if trying to dislocate it. The inner tie- rod end is a ball and socket arrangement, any dirt or water etc. in there can grind away material, making for a loose fit. If there is any discernible "popping" of the joint, there is a failure there. Oh, and it's dangerous to drive with. Last edited by fochs; 11-02-2013 at 11:10 AM. Read in another thread where someone else was experiencing the same problem with their Volvo (not a 940 Volvo) and they replaced the inner/outer tie rods both sides and lower ball joints and that solved the problem. I did the same although the mechanic had indicated by the wheel shake that the rods were good. In any case after the rods were out the right inner rod, where the problem was, definitely had a very slight "click" in the ball joint when pulling/turning the rod. The "click" is subtle, perhaps no more than a quarter inch, if that, and would be hard to detect when installed and trying to assess the rod by moving the tire. With the new inner/outer tie rods and right lower ball joint the problem has gone away. 91' 940 Turbo Shudders while idling.